I recently wrote an article for Ryan Leary’s CruiterTalk blog titled, “Anyone Can Learn the ‘Art’ of Sourcing.”Although the main point I wanted to make was that sourcing isn’t all that mysterious or difficult, and that it can be taught and learned with a strong interest to do so and access to proper training and guidance, the post drew some comments and sparked a mini-debate on Twitter over whether or not sourcing and recruiting are more heavily based upon “science” or “art.” I’ve also found that a good number of people seem to think that the “art” of recruiting can’t be taught. As expected, opinions will vary widely. However, I believe it is critical when examining this controversy that “science” and “art” be defined. I’ve found that many people struggle to explain exactly what they mean when they say “recruiting is 60% art.” Without a common understanding of the terms involved, there is a danger of misinterpretation down to the semantic level, which can seriously hinder any productive discussion. Looking at these definitions, I honestly think most people use the word “art” incorrectly when attempting to express their opinion about whether recruiting is an art or a science. If art is defined as skill acquired by experience, study, or observation, it means that it can be learned as well as taught. Furthermore, skill is defined as “the ability to use one’s knowledge effectively and readily in execution or performance. A learned power of doing something competently; a developed aptitude or ability.” So when it comes to the very definition of the word “art,” it appears to be unequivocal that “art” can be learned and taught. When I’ve debated with recruiting professionals over the topic of recruiting as art vs. science, it seems to me that what most people think of as “art” is something that is mysterious and not easy explain or to learn, something based more on emotion and tradition than logic. Some have explained to me that the “art” of recruiting is based on intangibles – imagination, creativity, drive, tenacity, ambition, judgment, “feel,” etc. I agree that most of these things can’t be taught or transferred from one person to another. But these intangibles don’t even define “art” – at least not according to the dictionary. “Systematized” means to order systematically – which means something that can be presented as a coherent body of ideas or principles, be methodical in procedure or plan, and marked by thoroughness and regularity. In my experience, those who feel that recruiting is more art than science seem to look down upon the idea that recruiting can be broken down to a science, as if that would be a bad thing. However, I don’t see anything negative at all in that the entire recruiting life cycle can be systematically and thoroughly broken down into general truths and laws (aka best practices) that can be studied, learned, and applied. Does that sound like a bad thing to you? I appreciate the concept that science can refer to a highly skilled technique or practice. Most sourcing and recruiting “experts” would consider themselves highly skilled (I hope). Let’s not forget that “skill” is actually the dictionary definition of “art” (skill acquired by experience, study, or observation). What I find especially interesting about this definition is that it specifically references the ability to follow a practice that can produce predicable results. If there is not an underlying science to recruiting, how could a recruiter ever hope to produce consistent results and acheive consistent outcomes? That passage was taken from one of my favorite recruiting articles of all time, “Best Recruiting Practices from the World’s Most Business-like Recruiting Function.” – be sure to click “next” at the bottom to read parts 3, 4, and 5. I feel that a good number of the people who think of recruiting as mostly “art” are those who have not had the opportunity to be trained by someone who is capable of breaking the recruiting life cycle down into a systematic practice that when consistently applied, produces predictable results. Others have perhaps never taken the time to think about their recruiting best practices (that hopefully they consistently perform!) and attempt to break them down into defined repeatable processes – but that does not mean that they can’t be broken down into systematized knowldge and taught to others so that they can produce similar results. When I started in recruiting, I received very little training. I learned most of my recruiting best practices by trial and error (the poor man’s scientific method) in the pursuit of achieving predicatable results – more closes/hires than anyone else in my company. If you had asked me back in 1997, after I had achieved 71 hires in 9 months within my first year of recruiting, if I felt recruiting was more of an art or more of a science, I probably would have told you that it was more art. However, that would be because at the time, I never thought twice about what I did day in and day out – I just did what I did and I got results. Only once I was promoted into a recruiting management role did I take the time and effort to step back and take another view of my recruiting best practices. I had to. In order to be able to train others and develop their skills and ability, I had to break my thought processes and actions down into a system of repeatable processes that could produce consistent results. If I didn’t, how could I hope to transfer my knowledge and skills to anyone else? Just because someone is or has been a top producer, it doesn’t mean that they will be an excellent trainer. I’ve worked with top performers who can tell you WHAT to do, but that can’t really tell you HOW to do it, or explain exactly WHY. Highly skilled recruiting trainers can tell you WHAT to do, as well as HOW and WHY to do it. The HOW comes from the ability to break a recruiting best practice down to a repeatable process that anyone can apply and follow, and the WHY comes from the deep understanding of exactly why the particular technique or strategy produces consistent results and the ability to explain it in terms that anyone can easily understand. It’s also important to point out that “once and done” training methods, typically provided by third-party recruiting trainers, aren’t as effective as training delivered by in-house recruiting experts. I’ve trained hundreds of recruiters in my career, and I can tell you definitively that I was most effective when I was in a Recruiting Director role where I worked with a recruiting team day in and day out, hands-on and “sleeves up.” Imagine learning how to play golf with Tiger Woods beside side you every time you played, coaching you and showing you techniques and explaining what he would do in each particular situation and why. When I compare that to training scenarios where I visit an office, spend three days with the recruiting team, and then leave and not return for a year (or more!) – it’s an apples to oranges comparison. That’s like getting 3 days of hands-on coaching from Tiger Woods – once. The difference is in the ability to apply the what you’ve been trained to do under the the constant guidance and supervision of an expert. People learn most effectively by DOING (especially under the guidance of an expert), not by listening and watching for an hour, or even for three days. Science is Cool and Creative! I believe some people recoil at the thought that recruiting could be mostly a science because “science” can be perceived to be boring, sterile, and uncreative. However, I think nothing could be further from the truth. Some of the most creative minds are those who work in various scientific disciplines. Do you need to be reminded where Internet came from, Google, your iPhone, the theory of relativity, or Penicillin? Do you think there is nothing exciting or creative about attempting to find a cure for cancer? The term “science” does not need to carry with it any perceptions of artificial rigidity or a lack of creative thought. The scientific method may sound sterile, yet it refers to a body of techniques for investigating phenomena, acquiring new knowledge, or correcting and integrating previous knowledge. Hmm… investigating and learning new things – worthy endeavors that everyone should strive to perform in my book! 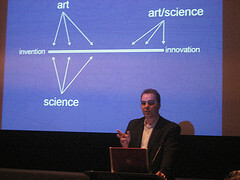 The “science” of recruiting does not have to be limited to the mechanics of performing a task or following scripts word for word – the “science” of recruiting actually involves interpretive thought and the creative application of techniques and strategies “on the fly” in dynamic scenarios as required in order to produce consistent results. Yes, recruiters can be trained to think and be creative when faced with objections, difficult positions, hard closes, or any other recruiting challenge. If you can’t break something in recruiting down into a process (the WHAT) and explain to someone HOW and WHY to do it, you can’t train it or learn it effectively. However, I firmly believe that recruiting best practices throughout the entire recruiting life cycle can be broken down into repeatable processes that can be explained and taught to others to apply creatively and dynamically. If recruiting could not be broken down into a series of repeatable steps and best practices that produce a predictable outcome, including steps involving thought, interpretation, and analysis – how could recruiting be taught and how could anyone learn it? Furthermore, I believe that the 20% that is “art” is not actually tied to the recruiting life cycle or process itself. I believe the “art” comes from the person performing the recruiting role – in other words, the “human factor” in the equation. As I’ve previously mentioned – you can’t teach someone to be passionate about recruiting, nor can you teach someone to have a solid work ethic, or to be tenacious and driven to produce great win-win recruiting outcomes. Each recruiter is unique, inevitably bringing their own set of intangibles to the application of recruiting best practices. In my experience, even judgment and “feel” can be taught to a certain extent – but it won’t come from a single training class. It can be accomplished under the guidance of recruiting manager, coach, or mentor (however you define the role) who works with you on a daily basis and provides you with feedback and suggestions for any scenario you encounter. I feel that I’ve been able to take what most people mislabel as the “art” of recruiting and transform it to a science – taking recruiting beyond just something that people do and can’t explain, and systematically and thoroughly breaking down the entire recruiting life cycle into general truths and best practices that can be taught, studied, learned, and applied with great success. And I am not alone or special in this regard – many others have been able to accomplish the same thing. The inability of a person to learn recruiting is more often the result of poor training, a lack of genuine interest and motivation, or a general lack of ability to learn and apply the specific skills necessary to be a recruiter. It is not because recruiting is more “art” than “science.” Just because some people can’t learn recruiting, it does not mean that it can’t be taught. It’s no different than the reason why some people will never be great golfers – no matter how good their training or instructor is, or how often they practice. It just means that some people are not able to pick up the skills necessary to be a highly competant recruiter. Have an opinion about this topic? Let me know! I am especially interested in getting more ideas from those of you who believe recruiting is more “art” than “science.” My one request is to please do your best to articulate precisely what aspects of recruiting you believe to be “art” – and please be sure to let me know exactly how you define “art.” Thanks – I look forward to your comments!